The British author of Enemies of Society (1977), a diatribe against Freudianism and Marxism, has cast his likes and dislikes in a historical narrative. He is partial to Warren Harding and Calvin Coolidge, whose public philosophy appeared to possess a degree of concordance with the actual facts of life which was rare in human experience--in this case, laissez faire combined with enrichissez vous. On the other hand: Marx's invention of the 'bourgeoisie' was the most comprehensive of. . . hate-theories and it has continued to provide a foundation for all paranoid revolutionary movements, whether fascist-nationalist or Communist-internationalist. Modern theoretical anti-Semitism was a derivative of Marxism. This comes in a chapter on the rise of Hitler. Another egregious utterance is the offhand comment, in a discussion of early-1930s Cambridge, that Lytton Strachey confided to Keynes, with whom he was already competing for the affections of handsome young men. Since the topic is the importance of friendship to this group, and the paragraph ends with E. M. Forster's famous line about choosing friendship over patriotism, Johnson has managed to feed the can't trust a homosexual school of public policy along with his more deep-seated prejudices (which he groups under the heading of moral relativism). 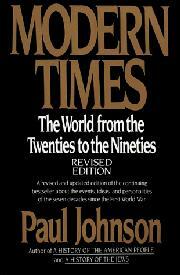 The result is that all of Johnson's historical judgments are suspect. He muddies things by claiming that the Left was the first political grouping in Spain to resort to violence in what became the Spanish Civil War (the violence being strikes), and points out that the Popular Front received less than 50 percent of the vote in 1936, making it less than completely legitimate. On Vietnam, he argues that the United States shouldn't have gotten so involved, but then should have occupied the North (how?). The 20th century as a whole is to Johnson one long and unsuccessful attempt at social engineering from which he would like to retreat. Cankerous.